What Does Your Museum's Stroller Parking Look Like? Today, during a Master's Thesis defense on creating shared learning spaces inside History Museums, a conversation came up about Stroller Parking that really intrigued me. So let's step deep, deep into the weeds of a very specific museum/exhibit/design topic, shall we? As all types of museums (not just Children's Museums and Science Centers!) and cultural organizations strive to become more welcoming to family audiences, these institutions often find themselves facing traffic jams of strollers inside their pristine hallways and common areas. 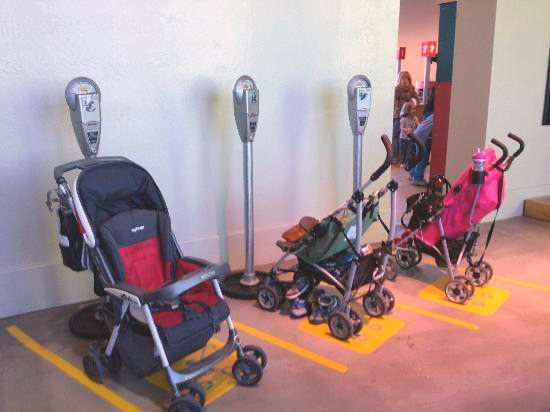 Many museums, in an effort to restore a semblance of order (visual and otherwise) often designate areas willy-nilly near stairways or gallery entrances with a sign stuck on the wall labeled "Stroller Parking." But let's face it, most of these Stroller Parking areas have all the visual panache of a turnpike restroom. Can't we do a little better (for ourselves, and our family visitors) than a virtual used stroller lot jammed into an underutilized corner? We've done this before with a crowd-sourced ExhibiTricks post about donor recognition walls, so I'm expecting great things from you, dear readers! I'll give you some inspiration to get started on your submission by highlighting the image at the top of this post showing one of the Phoenix Children's Museum's Stroller Parking areas. It's fun, it's intuitive, and it sends the right kinds of messages to family visitors. So, email me an image of a well-considered Stroller Parking area, a brief description of why you like it, as well as the location or institution featured, and I will gather up all the words and pictures for a future ExhibiTricks post and a downloadable PDF on the subject!